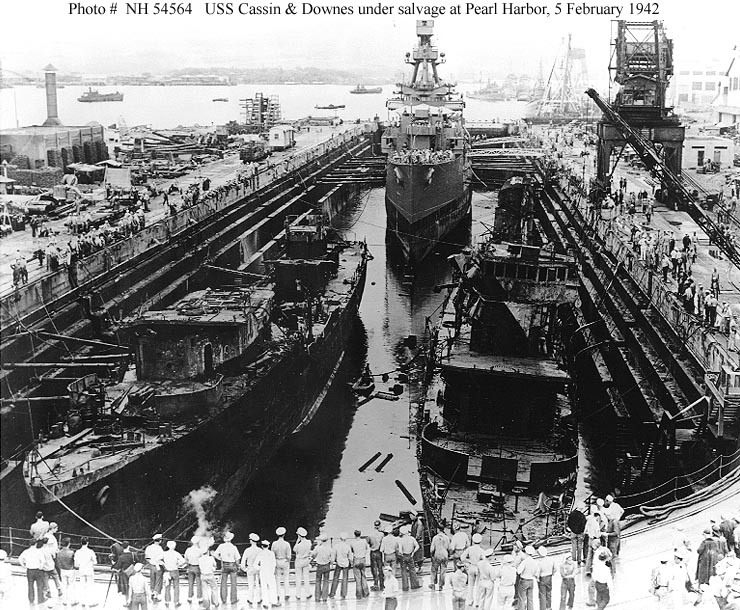 Damage to USS Downes was so severe that she was initially thought to be only worth salvage to clear the drydock in which she rested alongside the capsized USS Cassin (DD-372). 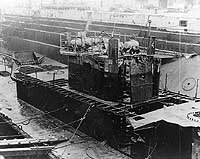 However, it was soon found that the two ships' machinery, hull fittings and main battery guns could be repaired. During December 1941, efforts began to strip the ships of guns and other equipment and patch up their hulls to make them watertight enough to float. 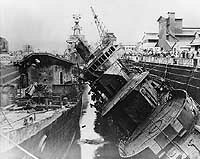 The salvable items would be shipped to the Mare Island Navy Yard for installation in new hulls, and the old hulls scrapped at Pearl Harbor. 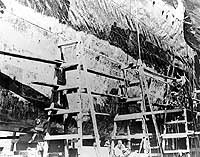 By 5 February 1942, work had progressed sufficiently to allow Cassin to be turned upright. 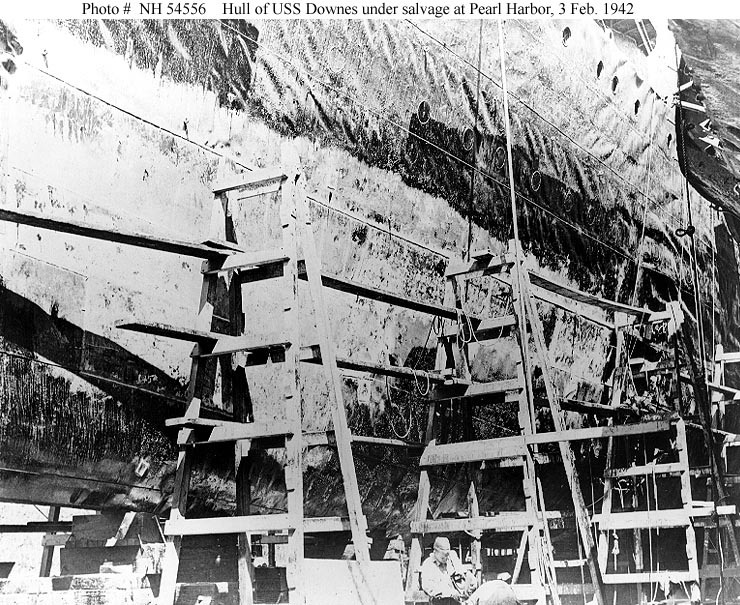 A day later, Downes' remains were towed clear of the drydock for further work and eventual scrapping. 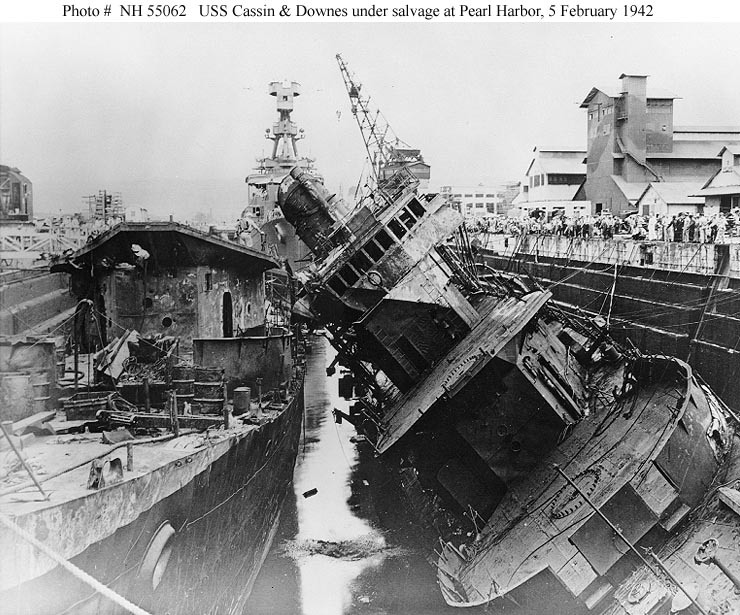 This page features all our views of the salvage of USS Downes (DD-375) in December 1941 - February 1942. 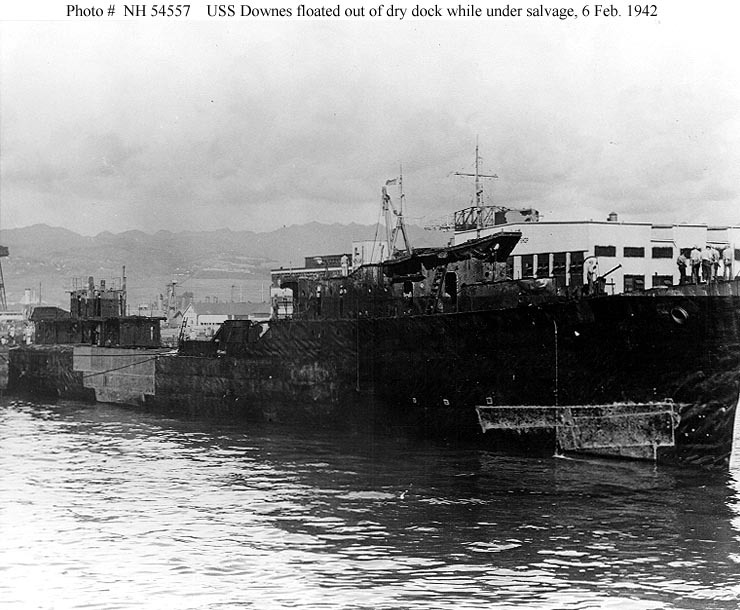 USS Downes -- Damaged at Pearl Harbor, 7 December 1941. View of the ship's after deckhouse, seen from off the starboard side amidships, while she was undergoing salvage in Drydock Number One at the Pearl Harbor Navy Yard, 7 January 1942. Foundations for her after 5"/38 gun mounts are visible. The guns had been removed during the early stages of the salvage work. USS Cassin (DD-372), also with her guns removed, is capsized against Downes' port side. Both had been wrecked during the 7 December 1941 Japanese air raid. Note what appear to be air compressor carts atop the upper deckhouse. 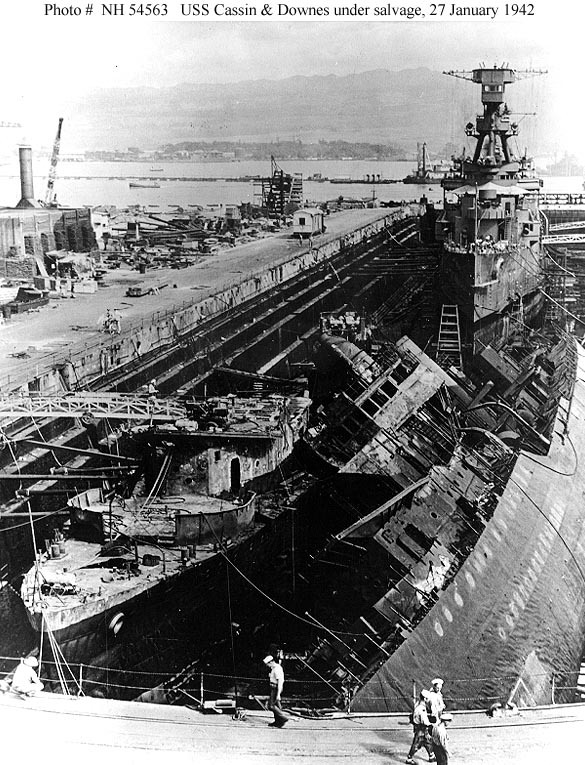 Under salvage in Drydock Number One at the Pearl Harbor Navy Yard, 23 January 1942. They had been wrecked during the 7 December 1941 Japanese air raid. Photographed from the foremast of USS Raleigh (CL-7), which was undergoing battle damage repairs in the drydock. Under salvage in Drydock Number One at the Pearl Harbor Navy Yard, 27 January 1942. They had been wrecked during the 7 December 1941 Japanese air raid. Also in the drydock is USS Raleigh (CL-7), which was under repair for torpedo damage received on 7 December. 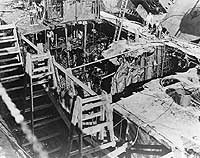 View of the ship's midship's section, looking aft and to port into the machinery spaces, while she was under salvage in Drydock Number One at the Pearl Harbor Navy Yard on 2 February 1942. She had been bombed and burned out during the Japanese attack of 7 December 1941. Visible in the upper right, toppled against Downes, is USS Cassin (DD-372). 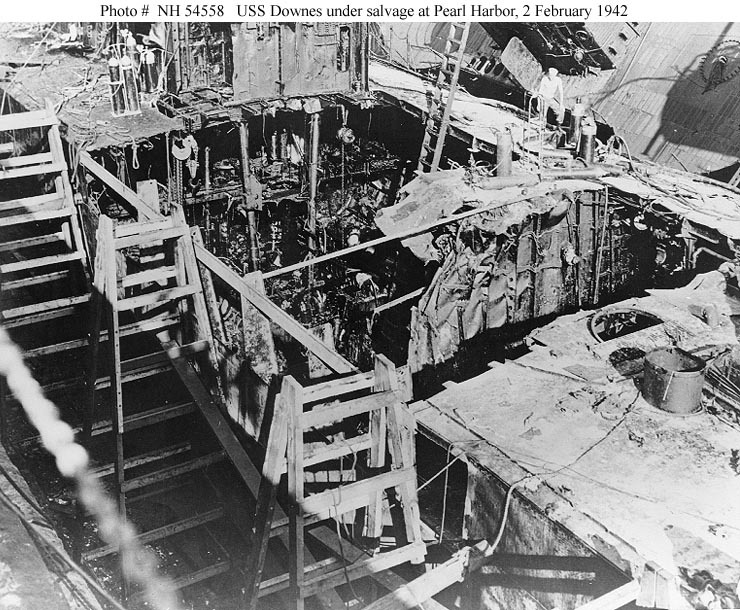 View of the ship's port hull side, forward, while she was under salvage in Drydock Number One at the Pearl Harbor Navy Yard on 3 February 1942. 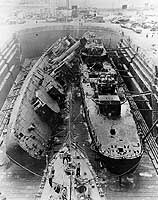 View looks up from the drydock floor, showing fire damaged hull plating. 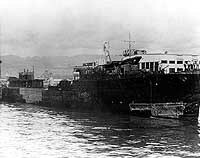 Downes had been bombed and burned out during the Japanese attack of 7 December 1941. 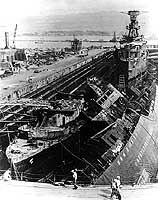 In Drydock Number One at the Pearl Harbor Navy Yard, 4 February 1942, while under salvage. 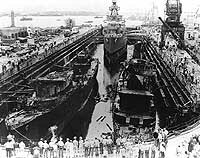 Both destroyers had been wrecked in the drydock during the 7 December 1941 Japanese attack on Pearl Harbor. In the background, also in Drydock Number One, is USS Raleigh (CL-7), receiving repairs for torpedo damage received in the Japanese attack. 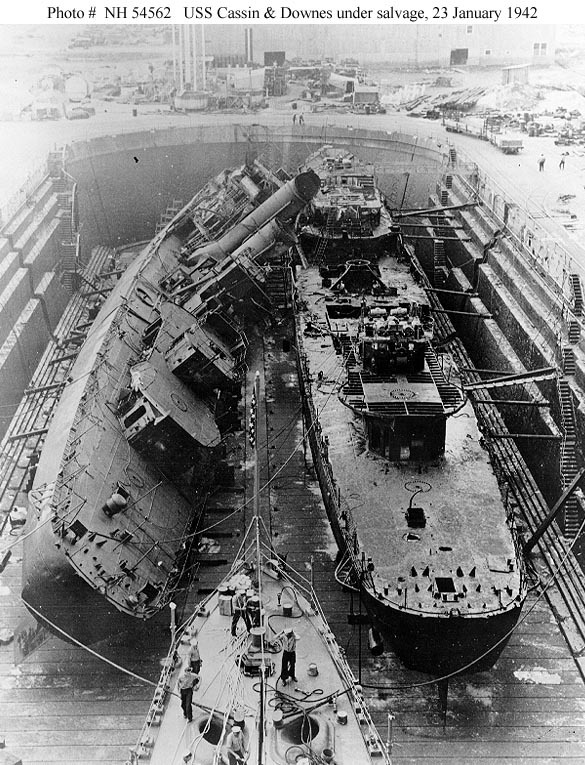 Under salvage in Drydock Number One at the Pearl Harbor Navy Yard on 5 February 1942, the day Cassin was righted from her previous position capsized against Downes. They had been wrecked during the 7 December 1941 Japanese air raid. 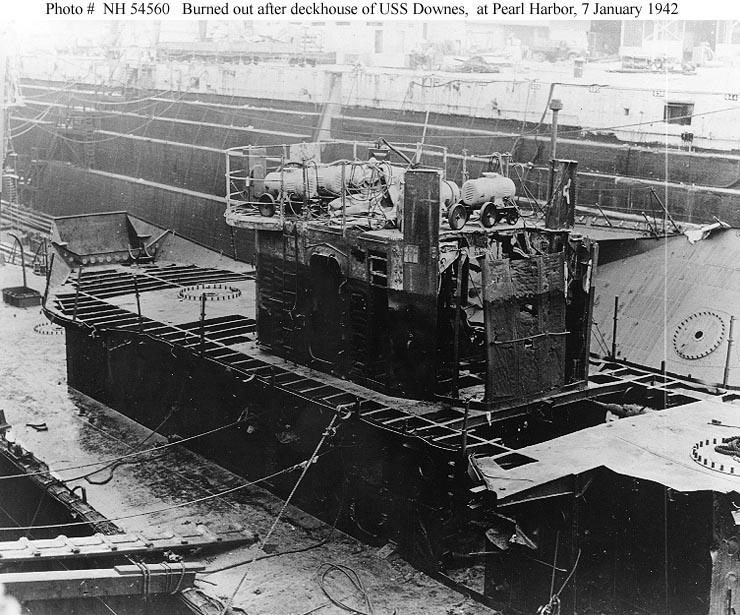 Being floated out of Pearl Harbor Navy Yard's Drydock # 1, while under salvage on 6 February 1942. Light colored patches cover areas of severe damage to her hull. She had been bombed and burned out during the Japanese attack of 7 December 1941. In addition to the views presented above, the following view of USS Cassin, also taken during the salvage effort, shows a small portion of USS Downes: Photo # NH 55061.